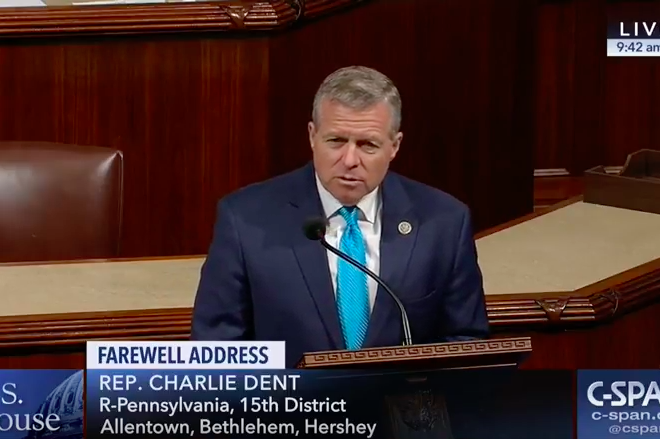 U.S. Rep. Charlie Dent, R-Pennsylvania, gives a farewell speech on the floor of Congress on Thursday, May 10, 2018. Charlie Dent, the moderate Republican congressman from Pennsylvania who President Donald Trump accused of "destroying" the GOP, took time in his resignation speech Thursday to criticize his own party and Democrats for their reactions to the Trump presidency. Dent, who represents Northampton and Lehigh counties as well as parts of Berks and Montgomery counties, announced in September he would be retiring, but recently decided to resign rather than finish his current term. During his farewell tour, he hasn't been shy about critiquing Republicans. Earlier this year, he equated the party's dysfunction to a drunk father. Friday will be Dent's last day, and during a farewell speech in which he thanked his colleagues, staff and constituents, the seven-term representative took time to decry the rising polarization in Washington. "Unfortunately, due to disruptive political influences, increased polarization has led to Congress becoming more paralyzed, unable to perform even our most basic and fundamental tasks." Dent pointed to the 2013 federal government shutdown as a clear example, suggesting the polarization has continued, leading to the rise of "fringe elements" on both sides of the political aisle. "Too many Republicans expect blind, unquestioning obedience to President Trump, no matter how absurd or destructive the comment or behavior," Dent said. He implied some Republicans had a double standard about Constitutional separation of powers for Trump compared to former President Barack Obama. "On the other side, far too many Democrats offer unflinching resistance and opposition to President Trump, even if they agree with him on a given policy or position. Separation of political parties has replaced separation of powers as a guiding, governance philosophy. This dynamic is simply not sustainable and it is already having troubling consequences." Dent said that while he's leaving Congress, he still plans to fight for the "sensible center" and lead a new "center-right movement" to counter the "incendiary rhetoric, chaos and dysfunction that we have unfortunately grown accustomed to in recent years." You can watch his entire farewell speech below.